This entry was posted on Tuesday, February 20th, 2007 at 9:22 pm	and is filed under Uncategorised. You can follow any responses to this entry through the RSS 2.0 feed. You can leave a response, or trackback from your own site. 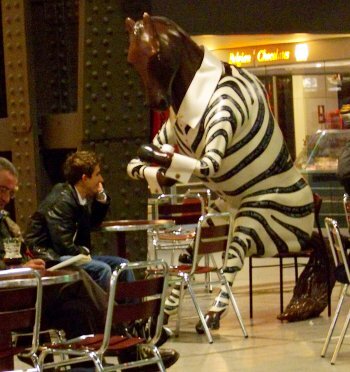 Looking at it again now, I can see that it’s not really a Zebra at all, it’s a horse wearing a striped suit. Or a zebra wearing a fake horses head?? I can’t see no invisible table! Did anyone notice that there is white writing on the black stripes?